WASHINGTON - The George Washington Alumni Association and GW President Steven Knapp honored the five recipients of the annual Distinguished Alumni Service Award and the first annual Jane Lingo Distinguished Alumni Service Award at a ceremony this evening at the St. Regis Hotel in Washington, D.C. The Distinguished Alumni Service Award is given to graduates who advance the mission of the university through dedicated volunteer efforts in support of its programs, thereby ensuring the university's impact on its community and future generations of students. The award has been presented annually since 1959. "These awards demonstrate the value we place on service as a lifelong pursuit," Knapp said. "These five alumni have dedicated years of effort to improving GW across a range of programs and initiatives. We are delighted to have this opportunity to thank them." Kamden Hoffmann, M.A. '02, M.P.H. '03, is a specialist in child and maternal health with the United States Agency for International Development. As president of the Public Health Alumni Association since 2006, Hoffmann has reorganized and revitalized the association. Additionally, Hoffmann has been a member of the GW Alumni Association Board of Directors since 2006. Candace G. Kaplan, B.A. '70, is the founder, CEO, and president of Kaplan Financial Group, a financial services and consulting firm. Kaplan has served as the chair of the Columbian College's National Council for Arts and Sciences since 2005. Due to her demonstrated commitment to the university, Kaplan was tapped in 2005 to serve on the search committee to select the new Columbian College dean. Alexia Morrison, J.D. '72, is an attorney for the McCammon Group, a leader in mediation and arbitration. Morrison, who served as a committee chair of the Law School Board of Advisors since 1999, is a former president of the GW Alumni Association (1997-1998) and was a member of the GW Board of Trustees (1999-2005). In addition to her numerous volunteer duties, Morrison is an adjunct faculty member of GW's Law School. Christopher Young, B.B.A. '80, M.Accy. '83, is a principal at Deloitte Consulting, LLP. Young has served on the GW Alumni Association board of directors as treasurer (2002-2004), president-elect (2004-2005), president (2005-2007), and past-president (2008). He also supports the GW Career Center, co-chaired his 25th reunion, hosted a Summer Connection event for incoming freshmen, and connects with students through the "Dinner with Alumni" program. Amy Mazur, B.A. '71, M.A. '74, Ed.D. '77, is a professor of special education and director of teacher training programs at GW's Graduate School of Education and Human Development. Mazur organized the GW student chapter of the Council for Exceptional Children in 1977 and has served as the university advisor to this group since its inception. She hosts reunion receptions for bilingual special education alumni, is a member of Columbian Women, and has volunteered for more than 100 GW committees. The Jane Lingo Distinguished Alumni Service honor is being awarded for the first time this year. The award commemorates the service of Jane Lingo, BA '46, who passed away in 2007. As an alumna, staff member, and friend, she was a lifelong participant in The George Washington University family. This recognition is awarded annually to a faculty or staff member who also is a GW graduate, and who consistently advances the mission of the university through dedicated volunteer efforts in support of its programs. 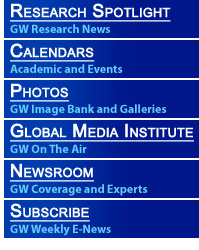 For more information on the GW Alumni Service Awards and the GW Alumni Association, please visit www.alumni.gwu.edu.